“They were talking about old days and old ways and all the changes that have come on London in the last weary years; a little party of three of them, gathered for a rare meeting in Perrott’s rooms. From “N”, by Arthur Machen (1863-1947), collected in “Machen’s Tales of Horror and the Supernatural”. My favorite Arthur Machen story, the enigmatically named “N” describes an otherworldly portion of London, visible only from the upper floor of a single building. It touches on what today would be called a multi-dimensional universe. Like many Machen stories the narrative is convoluted, it never treads a straight path when a roundabout route is available. Also typical to Machen is his unerring ability to set a mood that draws upon the antiquarian and cosmic dread. H.P. Lovecraft would draw more than a little influence from his stories. What I like most about “N” is the notion of a hidden city, just outside common view. 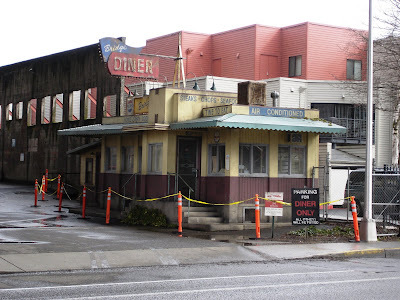 I have pictured such a place, perhaps on Vine Street downtown, a gateway to another Portland. Yesterday afternoon, after a week in sun drenched Arizona, I was jogging down Front in a downpour, reflecting on how Phoenix had its good points, even with its mile upon Walgreen & Safeway punctuated miles of sprawl. Soaked to the skin, I ran under the overhang of McCormick Piers parking structure, where I took small advantage against the rain. 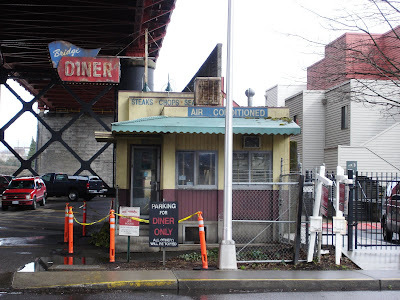 Then, under the Broadway Bridge I came across the Bridge Diner. With an incongruity that Arthur Machen would appreciate, even though I had passed by there hundreds of times, I had never seen it before. 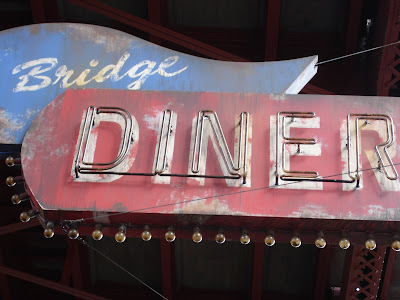 The Bridge Diner, unchanged after years of feeding workers from the Albers Mill and the Ainsworth docks, as well as porters and conductors off duty from nearby Union Station, with its menu of steaks, chops, seafood and breakfast. 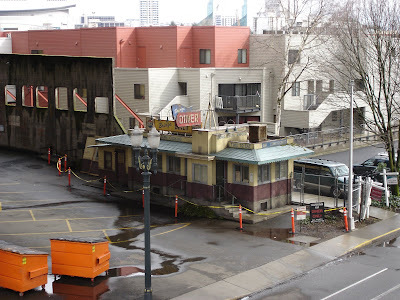 It has survived more than a few Willamette River floods. 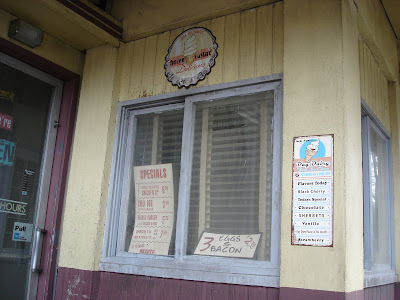 Despite inroads from the likes of Dennys and McDonalds, an American Express sticker on the door and the price of Honey Roasted Chicken ($6.95) hints that it had been open at least into the early 1990s. 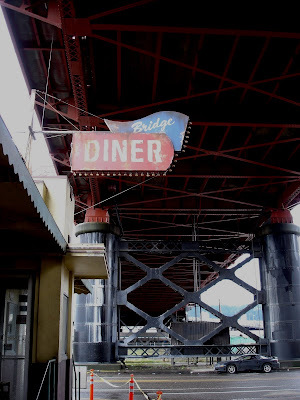 Like Dorothy’s house atop the Wicked Witch of the East, the Bridge Diner has appeared, apparently out of nowhere. I returned there today with a camera. The fact that it could be photographed does not bode well for a Machenian explanation which leads me to a more cinematic theory. Still, with so much of Portland lost without regards to history, it is refreshing to see something somewhat historic added without regard for the present.